Keeping my family safe in our own home is a top priority. I believe that our home is our castle and should be a safe place where our children can feel both completely safe physically as well as spiritually. Home break in's are becoming more common. I'm going to keep this post simple and only discuss what I have done to make it as hard as possible for criminals to gain access to our home. Watch this short video clip and you'll see what I'm talking about. You all need to know that most doors are as easy to kick as the door in this video. 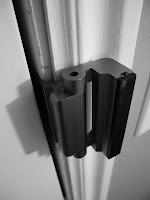 When your exterior doors were installed it is likely that they were not reinforced properly for a variety of reasons. Here are the things that you can do to strengthen your exterior doors. 1. 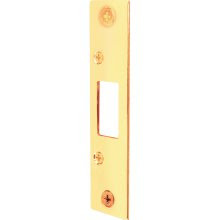 Most of the screws installed in the hinges and deadbolt plates of your door are probably only short 1" long screws. These short screws are only attached to the weak door frame. You need to replace these short screws with 3" long (or longer) screws that will attach to the framing of the house instead of the weak door frame. 'Grabber" screws will do but I highly recommend the SPAX brand screws as they are rated at around 650 lbs each. I am assuming that your exterior doors are standard steel doors. If they are a weaker door then you should consider replacing them. A solid wood door is an excellent choice. 2. 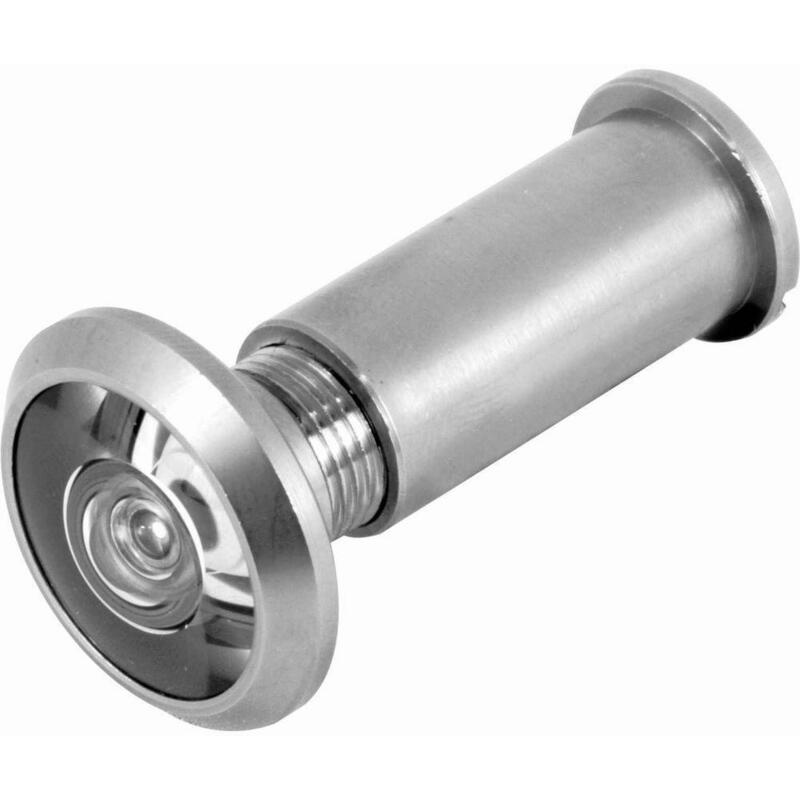 You should ensure that the two screws in the plate that receives your deadbolt (first of all you should have a deadbolt on your door. Yes, I have seen more than a few front doors that do not have a deadbolt.) are heavy duty screws. You can purchase a heavy duty striker plate that comes with long heavy duty screws at your local hardware store. They look something like this. 3. Install a viewer in your door. Never open your door unless you know who it is first. 4. 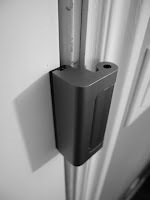 Install a door blocker lock. Actually, I have two of these installed on our door. One is installed at about knee height (about the height where the door would be kicked) and one about a foot above the deadbolt. I choose this particular lock for a few reasons. It attaches only to the framework of the house and not to the door itself. If you attach a lock to the door with screws it can not be strong enough to withstand multiple kicks. It is easy to install. It is rated to 8,000 lbs. It is easy to operate and inexpensive. As you can see, the lock blocks the door from being opened. It also makes for a great child lock when placed high off the floor. I also like these locks because they are small and not altogether unattractive. You can get these at either Home Depot or Lowe's. One draw back with using these locks is that they can not be unlocked from the outside. 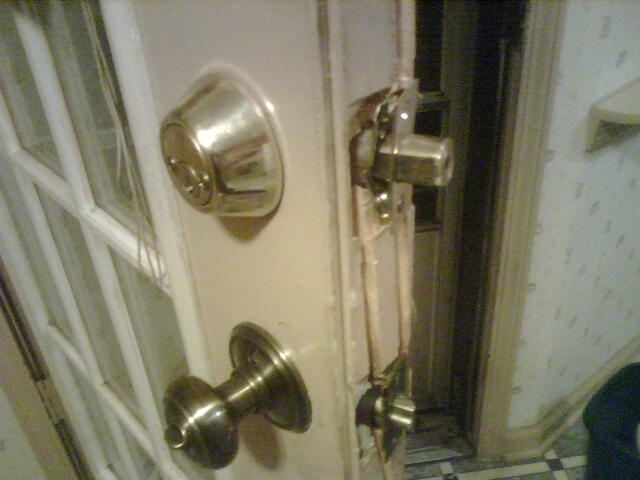 This is why you need to have a good deadbolt installed correctly as well. A problem that I see with the front door in the video is that I see is that there is a lot of glass in the door that makes it vulnerable. I recommend that if you want a window in your door to let in light that it be a window that is high off the ground like a 6 lite or fan lite door. Here is a picture of a door that has been kicked in. You can see what has happened to the deadbolt and the reason that I also use these door blocker locks. I have also installed locking window well covers on all of our basement windows. These locking covers are very easy to unlock from the inside. We have practiced with our children to ensure that they can both open their windows, unlock the covers, move the covers out of the way and climb out in case of an emergency. Ladders are installed in the deeper window wells. Windows and sliding glass doors can be protected by installing security films over the glass on both the inside and outside. Here's a video showing what security films can do. All of these things may not make it impossible for someone to break into your home. These measures will either deter or slow down a criminal breaking into your home giving you time to call the police and for you to retrieve your firearm. It becomes too tough to assure the security of the precious assets while leaving the home. It becomes worrisome especially if you have misplaced the bunch of keys, because it can be misused by some anyone. If you are residing at Chelmsford, you can give a call to the town centre based security firm for opening the locks with the help of master keys and replace all the security door locks to prevent further risks of theft or robbery. Nice Blog..Its important to give complete security to house..Appreciable!! are a major consideration. Both the kind of lock and the way it is mounted matter.